Brighten up your dinner table or create a striking mantle display with these hurricane candle holders. Brighten up your dinner table, create a striking mantle display or add instant illumination to a hallway table or shelf with these hurricane candle holders. 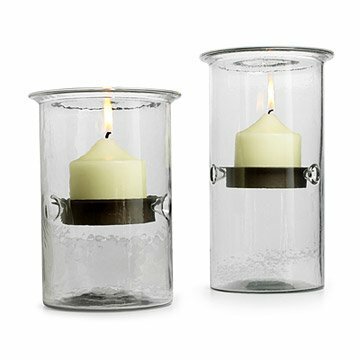 Made of clear glass and rustic metal inserts, these glass candle cylinders are sleek and functional, doubling as candle holders and vases. You can add glass gems or marbles to line the bottom of the containers to create your own unique design. So turn off the lights, light the candles and set the mood. Candle not included. Crafted by glass artisans in Colombia. Love the size, the shape, the whole lamp -- or both of them. They look great on the mantel....and they'll definintely stay there year-round, not just for the holidays. I really love candles so purchasing a candle holder was a no brainer. I just wish this came with a candle for the price it was. I still love it though. Looks lovely when burning a candle! We have a couple of these already. How ever the best price on them by far was on the Uncommon Goods website. The item was a brand name product and is made of quality material. Will shop here again. I bought one for each sister-in-law! I have one myself that is always on my kitchen table. I love that I can change the look with the seasons. I usually have white stones I collect on the beach below the candle, but for Christmas season I put in red glass balls. I gave one to each of four sister-in-laws, and personalized each gift by including something to put in the bottom that I thought they'd like. I purchased two of these for my mantle. For the holiday season, I put beaded garland in the bottom and it looks great. You do see the seams in the glass, so the workmanship is not the finest, but for the price, it's a great bargain and you do't notice the seam much once the holders are in place. One of the lips of one candleholder was damaged when I received it but uncommon goods replaced it very quickly with no hassle. This company tops any I have ever dealt with for customer service and satisfaction. I would recommend this company to ANY one ! These are nice hurricanes at a reasonable price.